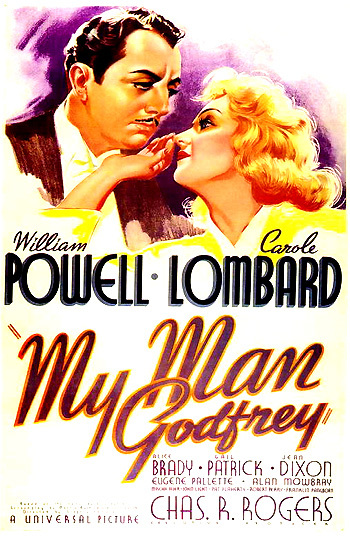 My Man Godfrey (1936) is one of the 1930's most delightful, classic screwball comedies. It was directed by Gregory La Cava for Universal and is now considered the definitive screwball comedy, with its social commentary on life during the 30s. The film, filled with marvelous character actors (Alice Brady, Eugene Pallette, Gail Patrick, and Mischa Auer), resonated with Depression era audiences for its statements on morality and class. [Note: On a side note, the real-life divorced couple of Powell and Lombard were married previous to the film's making, from 1931 to 1933.] The screenplay by Morrie Ryskind (a co-screenwriter for the Marx Bros.' A Night at the Opera (1935)) and Eric Hatch was based on Hatch's own short novel 1011 Fifth Avenue. The film displays the mad-cap personalities of a wildly rich, eccentric family. One of its members - a flighty socialite/heiress, finds a down-and-out "forgotten man" tramp in a hobo colony during a scavenger hunt, and hires him as the family's butler. The bum teaches them the realities of life, ultimately regenerates their confused, scattered lives, and reverses the nobility of rich and poor. The entertaining film was both a commercial and critical success, with six Academy Award nominations (but no wins), including Best Actor (William Powell), Best Actress (Carole Lombard with her sole Oscar nomination), Best Supporting Actor (Mischa Auer), Best Supporting Actress (Alice Brady), Best Director, and Best Screenplay. However, it set a milestone as the first film to receive nominations in all four acting categories and it remains one of the few films with that distinction in addition to not being nominated for Best Picture. In the same year, another William Powell film - The Great Ziegfeld - won the Best Picture and Best Actress awards, and Powell also appeared in Libeled Lady (1936) and After the Thin Man (1936). The film was remade in 1957 with David Niven as the "forgotten man" and June Allyson (in her next-to-last film) as the Lombard character. The credits are played, with Charles Previn's upbeat music, over a sketched, art-deco drawing of a cityscape [New York] next to a river. The camera pans from left to right along the waterside, picking up sequentially-flashing neon signs on the modernistic structures and warehouse buildings of the names of the cast, producer, director, and crew. At the conclusion of the pan, the camera stops on a dark, silhouetted view of a great bridge. In the foreground is a smoky city dump, where chimneys of a shantytown are visible. The drawing dissolves into a live-action image, revealing a a scene shrouded in darkness. A bum rakes a fire, and a dump truck expels trash. Refuse pickers are combing and picking through the mounds of discarded cans next to the East River. Godfrey Smith/Parke: (dryly) Mike, I wouldn't worry. Prosperity's just around the corner. Mike (Pat Flaherty): Yeah. It's been there a long time. I wish I knew which corner. Well Duke, I'm gonna turn in. Bon soir. Godfrey: Well, I don't mean to seem inquisitive, but what would I have to do for it? Cornelia: All you have to do is go to the Waldorf Ritz Hotel with me and I'll show you to a few people and then I'll send you right back....Oh, if you must know, it's a game. You've probably heard about it - a scavenger hunt. If I find a forgotten man first, I win. Is that clear? Godfrey: Yes, quite clear. Shall I wear my tails or come just as I am? Irene: I'm Irene. That was my sister Cornelia you pushed in the ash pile. Godfrey: How'd you like to have me push Cornelia's sister into an ashpile? Irene: Oh, I don't think I'd like that. Godfrey: Then you'd better get out of here. Godfrey: Wait a minute. Sit down. Another bum: (ominously) What's up Duke? Need some help? Godfrey: No thanks boys. I've got everything under control. (To Irene) Are you a member of this hunting party? Irene: I was, but I'm not now. Are they all forgotten men too? Godfrey: Yes, I guess they are maybe. Why? Irene: It's the funniest thing. I couldn't help but laugh. I've wanted to do that ever since I was six years old...Cornelia thought she was going to win, and you pushed her in a pile of ashes. Ha! Ha! Ha! Godfrey: Do you think you could follow an intelligent conversation for just a moment? Godfrey: That's fine. Do you mind telling me just what a scavenger hunt is? Irene: (in a breathless tempo, she makes an innocently-cruel statement) Well, a scavenger hunt is exactly like a treasure hunt, except in a treasure hunt you try to find something you want and in a scavenger hunt, you try to find something that nobody wants. Godfrey: Hmmm, like a forgotten man? Irene: That's right, and the one that wins gets a prize. Only there really isn't a prize. It's just the honor of winning, because all the money goes to charity, that is, if there's any money left over, but then there never is. Irene: Could you tell me why you live in a place like this when there are so many other nice places? Irene: Well, I'm very curious. Godfrey: It was because my real estate agent felt that the altitude would be very good for my asthma. Irene: My uncle has asthma. Godfrey: No! Well, now there's a coincidence. On a quick impulse, Godfrey agrees to accompany her - as a "forgotten man" so that she can "win the game" over her domineering older sister: "You'd win if you got back first with me." He agrees to appear at the party as her "forgotten man" and abruptly states: "Let's beat Cornelia." And he expresses his curiosity about the gala event: "I'd really like to see just what a scavenger hunt looks like." Blake (Selmer Jackson): This place slightly resembles an insane asylum. Bullock: Well, all you need to start an asylum is an empty room and the right kind of people. His line leads directly to the introduction of his scatterbrained wife of twenty years, a "dizzy old gal" named Angelica Bullock (Alice Brady), accompanied by her mooching artist/protégé Carlo (Mischa Auer) - she is dragging a goat behind her toward the podium where the harried, authoritarian scavenger coordinator (Franklin Pangborn) tallies up the scores amidst a chaotic melee of other competitors. Angelica is told that she is missing only two more items - a forgotten man and a bowl of Japanese goldfish. A blustery Alexander snarls that he is returning home without her: "If you want a forgotten man, you'll find me home in bed." My purpose in coming here tonight was two-fold: firstly, I wanted to aid this young lady. Secondly, I was curious to see how a bunch of empty-headed nitwits conducted themselves. My curiosity is satisfied. I assure you it'll be a pleasure to go back to a society of really important people. I'd never brought you here if I thought they were going to humiliate you. I'm terribly grateful. This is the first time I've ever beaten Cornelia at anything and you helped me do it...You've done something for me. I wish I could do something for you...because you've done something for me, don't you see?...Can you butler? He assures Irene's mother of his trustworthiness, even though he hasn't references or credentials: "People who take in stray cats say they make the best pets, Madame." Irene gloats when Cornelia appears, already beaten, with another "forgotten man." She disdainfully approves of Irene's offer of a job to her bum: "He might make a very good butler...I hope, Godfrey, that you're very good at shining shoes." Godfrey is given money to buy appropriate butlering attire ("a trick suit") and soon moves in with the family.